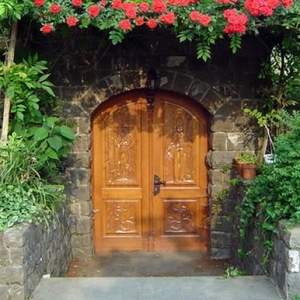 Across the valley's farms, open door periods called osmica are a popular custom attracting visitors from far and beyond. According to our traditional ways of selling wine and produce, the farmers open their doors for ten days, welcoming guests to a kind of temporary wine & food restaurant. 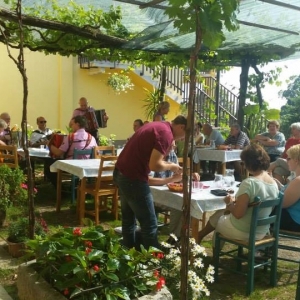 Osmica events normally happen twice a year, presenting genuine home dishes and small-farm produce while offering tastings of house wines, in the evenings at times accompanied by music and merrymaking. Written records suggest this custom developed as a farmers' right in the sixteenth century, under the rule of Emperor Charlemagne. It was introduced to the Valley with the decree of Empress Maria Theresa in the eighteen century, allowing winegrowers, for a period of eight days in a given year, to sell their own wine and produce at home in "makeshift wine taverns" as their houses were affectionately referred to for the duration. The tradition of osmice lives in the Vipava Valley to this day. 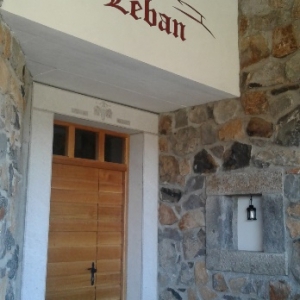 Here, during the first week of March and November every year, you will find traditional homemade specialties and a glass of the finest local vintage. Number of seats: 120. Opening hours: Monday–Friday 11.00–00.00; Saturday, Sunday 11.00–14.00. The osmica event entices with a hearty offer of home-made meats dried by the local burja wind: prosciutto, cured sausage, salami, pork neck and pancetta. The sausage selection features the special krotegini sausage, which can be served with sauerkraut. Boiled šturklji are a popular traditional sweet dish. 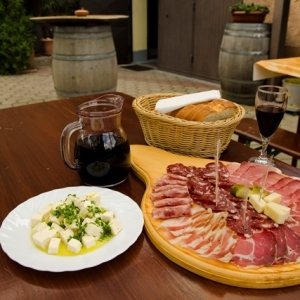 Enter this traditional osmica and enjoy the authentic local atmosphere with good food, great wine and friendly locals. Just have fun! A large space converted from and old hayloft welcomes guests for an osmica twice per year. This is usually around the Feast of St. Martin in November, and again in the spring, sometime in April or May. Menu: homemade juice and wine, charcuterie, stews and casseroles, sausages, steaks, all styles of potato, and much more. The Faganeli family farm has been organizing its very own osmica event. In a cosy ambient that feels almost like home, guests are served hearty flavourful dishes made from home-grown produce. 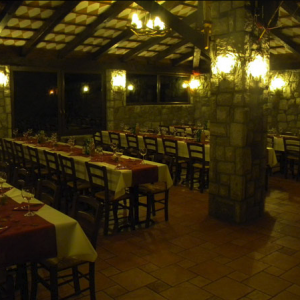 This traditional Karst osmica indulges guests with authentic local dishes and its own wine. 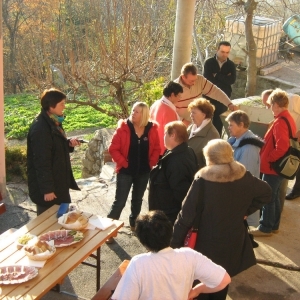 The Vrban farm in Šempas has been in operation since 1998. Guests will get a glass of a great vintage grown on the farm, along with plenty of other homemade alcoholic and non-alcoholic beverages, stews and casseroles that are typical to the region, as well as tasty desserts. Visitors will find delicious food grown and made on the farm, including charcuterie, seasonal desserts, bread, spirits and liqueurs, wine, vinegar, and delectable cherries and persimmons when the season is right. Number of seats: 140. 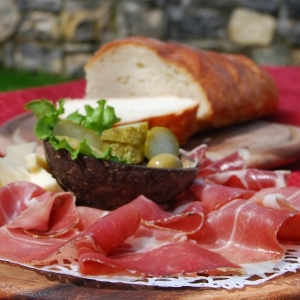 They serve up rustic fare that is typical of the Vipava Valley, such as jota (a sauerkraut or sour turnip and bean stew), prosciutto, cheese, turnips, pork steaks, sausages, sauté potatoes, charcuterie, pancetta, štruklji (rolled cottage cheese or walnut dumplings), and so much more. Number of seats: 80. The tradition of holding an osmica goes back countless years and the custom is still alive and well today. Twice a year this farm opens up its doors to visitors, who can forget about their troubles over a plate of homemade food and a glass of delicious wine. Highlight: Zelen, Pinela, and Picolit. 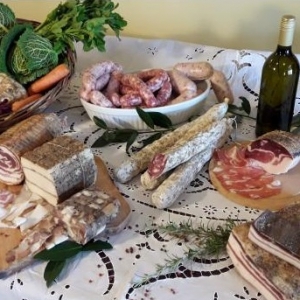 The Malovščevo farm is known for its authentic Vipava Valley dishes and charcuterie, and at the end of February they also open their doors for an osmica. 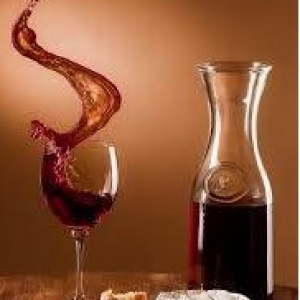 Visitors will taste the best wines from the farm’s wine cellar. Highlight: visitors can also sleep off their delicious meal.